This month, guest blogger Michelle Matte, CSCS has been discussing diabetes in recognition of American Diabetes Month. We started with a general overview to increase awareness about diabetes. We then focused on Managing Type I and 2 Diabetes through Exercise , Nutrition and Diabetes and Children and Type II Diabetes. Today we will discuss Diabetes During Pregnancy. During pregnancy, many changes take place in your body over which you have no control. Weight gain, fluid retention and fatigue are common changes that go away once the baby is born. While some of these physiological fluctuations are harmless, some, like gestational diabetes, can have negative repercussion for both you and your baby. The American Diabetes Association estimates that as many as 9.2 percent of expectant mothers will develop gestational diabetes. Learning about the causes and treatment of gestational diabetes can help you plan and prepare for a healthier pregnancy and a healthier baby. Gestational diabetes is marked by a rise in circulating blood sugar, brought on by hormonal fluctuations that affect insulin production. Other symptoms include fatigue, nausea, blurred vision, unusual thirst, frequent urination and a high incidence of skin, vaginal and bladder infections. Women over age 35, women who are overweight or obese, and women with a family history of diabetes may be at a higher risk. If left untreated, gestational diabetes can result in large birth weight, premature delivery, increased chance of Caesarian Section surgery, and increased risk of fetal death. Although gestational diabetes does not manifest itself until between the 24h and 27th week of pregnancy, lifestyle behaviors prior to and in the early stages of pregnancy may play a role. Regular exercise, healthy nutritional practices, adequate sleep and stress management may reduce your risk of developing gestational diabetes. 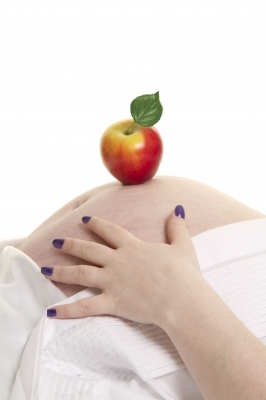 Soft drinks and juice, candy, cookies and other sugary foods should be avoided during pregnancy. Staying hydrated with plain fresh water will help your body’s systems function at optimal levels. Strategies for treating gestational diabetes include modifications in physical activity and nutrition. The American College of Sports Medicine and the American College of Obstetricians and Gynecologists recommend at least 30 minutes per day of aerobic exercise that involves repetitive movement of large muscle groups. Activities like walking, swimming, elliptical training and other sustained rhythmic movement are appropriate. Cycling may prove hazardous in the later stages of pregnancy due to weight redistribution and a shift in your center of gravity that can throw you off balance. A whole foods diet that includes plenty of fresh produce is recommended. Steer clear of processed carbohydrates like flour, corn, wheat and rice, and avoid processed snack foods and junk foods. American Pregnancy Association: Gestational Diabetes. British Journal of Sports Medicine: Guidelines of the American College of Obstetricians and Gynecologists for exercise during pregnancy and the postpartum period.